Hey, Ninja, it’s adventure time! 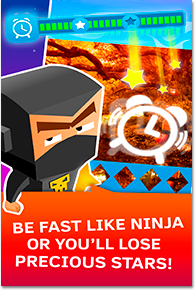 Join Ninja in his brave battle against the dark forces! Brain Ninja is a whole new mind games for adults with puzzles in the genre of find the picture. Venture into mind-blowing missions where your task is to save the world from the evil using all your attention and memory. Travel around the world, dive to the bottom of the ocean or find yourself in a fantastic forest! Solve very hard and challenging puzzles as fast as you can to collect stars and open all missions. All you need to do is to match a fragment and its spot on the picture before time runs out. Find objects in a picture but be accurate and fast like a ninja! Don’t let the evil twin ninja brother steal stars! 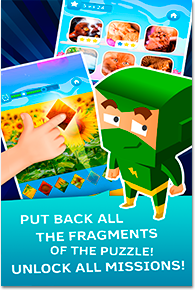 * 6 crazy missions with smart puzzles: ninja and the city, crazy holiday; saving fluffy kittens; at the bottom of the ocean; the flower valley; the fantastic forest. More insane tasks on the way! * These logic puzzles work perfectly well both on smartphones and tablets. 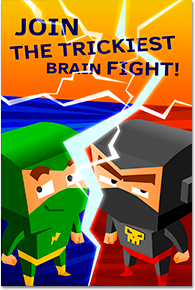 Become a Master Ninja by solving the very difficult puzzle games!